Location: At lower left canvas verso. Location: At lower left canvas stretcher verso. 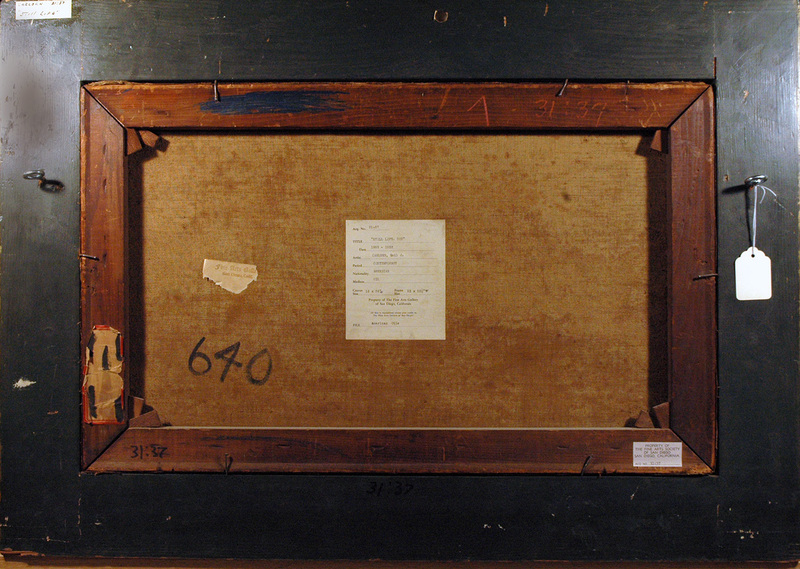 Location: Upper right canvas verso wood stretcher. Location: At center canvas verso. Text: ‘Acq. No. 31:37 / TITLE “STILL LIFE: COD” / Date 1853-1932 / Artist CARLSEN, Emil J. / Period Contemporary / Nationality AMERICAN / Medium OIL / Canvas Size 16 x 26″W Frame Size 33 x 23-1/4″W / Property of The Fine Arts Gallery of San Diego, California / If this is reproduced ? ? / The Fine Arts Galleries of San Diego / FILE American Oils’. Location: At center left canvas verso. Text: ‘Fine Arts Galle / San Diego, Calif.’. Location: At lower left canvas wood stretcher verso. Text: ‘[shows marked out label with no type]’. Location: At lower right canvas wood stretcher verso. Text: ‘PROPERTY OF THE FINE ARTS SOCIETY / OF SAN DIEGO / SAN DIEGO, CALIFORNIA / ACQ. NO 32 : 37’. Location: At center right frame verso on eye hook. – 2012 Collaboration In three parts: Forms at the San Diego Museum of Art, Figures at the Timken, Museum of Art, and Frontiers at the Museum of Contemporary Art San Diego ; Collection Checklist, 2012 [published for internal use only but accessed online with no restrictions via Google]. – Owner ship confirmed in 1971 by San Diego Museum of Art, Balboa Park, San Diego, California 92101 to the American Art Archives, Smithsonian. – San Diego Museum of Art [1926- ], San Diego, CA, “Inaugural Exhibition, Fine Arts Gallery of San Diego”, February 26 – March 31, 1926, illustrated: b&w on page 34, #12.